The Ultimate Fighting Championship is fast becoming one of the biggest sports in Australia outside of the nation’s traditional codes. The hysteria surrounding the sport hit fever pitch Down Under in 2016 when Ronda Rousey was KO’d by Holly Holm on a record-breaking Etihad Stadium night. Worldwide, it has become one of the most popular sports to both watch and bet on. It packs out stadiums wherever it goes and has become a truly global phenomenon. IT’S TIIIIME… to find a decent bookie to take your UFC bets. But never fear, you don’t have to trawl the Internet to land a bookie that won’t knock you out. We have done the hard work for you. Make sure you sign up with more than one of them to take advantage of the unique bookmaker promotions, bonus bets and welcome packages that will give you free money to play with. The UFC is recognised as the premier mixed martial arts competition, attracting the best fighters who combine a mix of unarmed combat methods such as judo, karate, wrestling, boxing and everything in between. 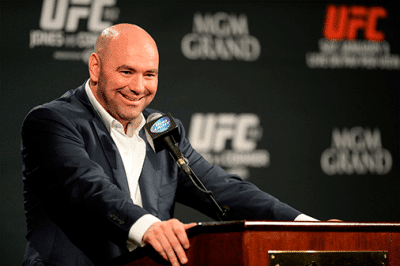 It has held over 300 events across the world, spearheaded by its larger-than-life president Dana White. It dates back to 1993, but that event in Denver was a mere shell of the juggernaut that now exists. These days the UFC ranks among the most valuable sporting commodities on the planet, having sold for some US $4 billion in July 2016. Fighters like Rousey, Conor McGregor and Mark Hunt have become household names for their performances both in the octagon and outside of it. MMA has also become a phenomenon in the punting world, with every online bookmaker worth its salt offering markets on just about every single UFC fight there is today. Whether it is prelims or the main card, you can find odds on every fight at the click of a button on your PC or smartphone. The bread-and-butter sporting bet. Head-to-head punting is dead simple: two fighters, going one-on-one in a battle of physical and mental supremacy. You have to decide which fighter has the fortitude to get the job done – and then lay your hard-earned on the line. First you need to know how many rounds there are in a fight – usually three or five in the UFC – and then you have to predict when the fight will finish. Whether their is a knock out or submission in the early rounds, or perhaps a points decision at the end, you have to pick. How will the fight end? Will one of the fighters beat the suitcase out of his or her opponent and knock them out? Or will they produce an unstoppable grappling game and wrench their opponent’s arms from their sockets, forcing a submission? How about if the two fighters give no quarter and end up making it to the end? More unlikely, but still possible, the two fighters could have a draw, just like Mark Hunt and Antonio ‘Big Foot’ Silva did in Brisbane back in 2013. What round will the fight end and how will it end? A combination of the two markets described above can produce some serious odds – with serious risk. To win, you need to pick the winner of the fight, the method they finish it in and the round the fight ends in. This will usually be presented in an over-and-under scenario. For example: in a five-round match, it might be over or under 2.5; in a three-round fight, it will probably be over or under 1.5. In lopsided match-ups the round figure can shift and some bookies offer alternate figures, as low as 0.5, if you think there is going to be a quick finish. Round betting involves selecting the winner of the fight and the round it ends in. So Brock Lesnar to win in the second round, Mark Hunt to win in the third round, etc. etc. Will one of the fighters end the fight early, or can they both make it to the end and leave it up to the judges to decide who wins? This is even harder, but it can give you juicy odds. You’re having a stab in the dark and it will usually offer you a figure of what time the fight will be ended from round one. It goes in 30 second increments, so good luck picking that out of a bag. There are three bet options here. It doesn’t matter who wins – you can choose knock out, submission, or points. This is a good one in an even fight when you can’t pick the winner. If they are both expert grapplers, they might end in submission; but if they like to stand and fight, then the knockout is the slugger’s bet. Gamble responsibly: Punting can be fun and very lucrative if you do it the right way. Before you even think of laying some money on a UFC fight, you need to ask yourself: “Can I afford this?” If the bills are paid, there is food on the table and all your obligations are met, then the answer is yes, and you can enhance your fight experience with a little flutter that could go a long way. Know your fighters: A little bit of research can go a long, long way. This is two people, in an octagon, fighting for their lives. Upsets are common in the UFC and the key to making real money is being able to predict just when one of those upsets is going to happen. The best way to do that is to make sure you know the intricacies and idiosyncrasies of the fighters you are betting on. How is their takedown defence? Do they stand and fight, or do they like to find the mat? These things matter. Fighter A may have destroyed their last opponent because they exploited a weakness that might not be so evident in Fighter B. Be across the injuries and training: You want to know that your guy or gal has the best chance of winning. If they are coming off an injury, they might not be in the best form or shape for a UFC fight. It might be your chance to pounce on an underdog. Don’t get caught out: To take advantage of the best deals, you’ll need more than one betting account. There is nothing worse than backing a UFC fighter to win, only to find you missed out on a heap of coin because another bookmaker offered better odds. Do yourself a favour.